Atrial fibrillation is the most common clinical arrhythmia encountered in cardiology. However, not all patients with atrial fibrillation are appropriate candidates for a percutaneous ablation. Atrial fibrillation can be a very debilitating arrhythmia and catheter ablation has helped scores of patients. However, the data on catheter ablation success rates can be difficult to interpret. For instance, only a handful of centers have reported single procedure success rates for their particular ablation strategy. Even fewer centers have stratified their success rates based upon the type of atrial fibrillation (e.g., paroxysmal, persistent, or chronic). The ablation paradigm offered by Dr. Williams at Lakeland Regional Health offers a success rate of ~80% for paroxysmal and ~60% for persistent atrial fibrillation. Procedural success is defined at 2 years after the initial procedure and requiring no interim procedure, antiarrhythmic drug therapy, or apparent arrhythmia burden. More importantly, the risks associated with catheter ablation of atrial fibrillation cannot be overstated. Using a retrospective case series, Cappato et al studied the incidence and cause of intra- and post-procedural death occurring in patients undergoing catheter ablation of atrial fibrillation between 1995 and 2006 from centers worldwide. Thirty-two deaths (0.98 per 1,000 patients) were reported during 45,115 procedures in 32,569 patients. Center experience did not appear to influence the incidence of death. The overall complication rate from atrial fibrillation ablations can be estimated at ~3-4%. Awareness of complication rates during atrial fibrillation ablations needs to be considered when discussing treatment options with the patient. The Invasive Electrophysiology Laboratory at Lakeland Regional Health uses the state-of-the-art CARTO XP Electroanatomical Mapping System and intracardiac echocardiography to indicate, in real time, exact location points from within the heart while simultaneously collecting local electrogram information. 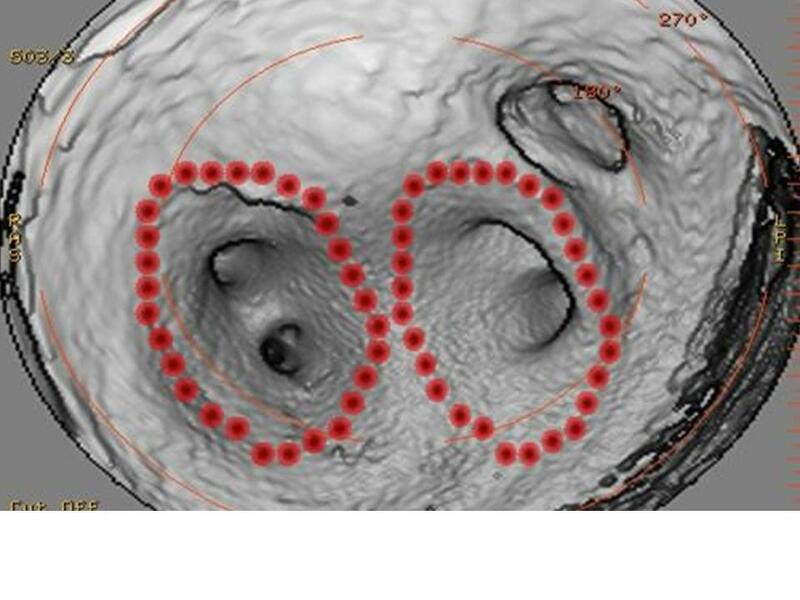 The 3D figure shown above depicts a typical lesion set delivered during pulmonary venous antrum isolation for atrial fibrillation. Schwartzman D, Williams JL, “On the Electroanatomic Properties of Pulmonary Vein Antral Regions Enclosed by Encircling Ablation Lesions,” Europace (December 23, 2008), eun361v1. Cappato R et al, “Prevalence and causes of fatal outcome in catheter ablation of atrial fibrillation,” J Am Coll Cardiol, V. 53, No. 19 (May 2009), pp. 798-803.